The Royal Sovereign RSL-2702S is a full featured table top 27 inch roll laminator that is designed for commercial applications where both mounting and encapsulation are required. The RSL-2702S is capable of laminating documents with films between 1mil and 5mil in thickness and can handle mounting boards that are up to 3/16" (6mm) thick. The RSL2702S offers easy to load supply shafts, a chain driven synchronized take-up device and the ability handle 1", 2.25" and 3" core laminating films. These features make the RSL-2702S one of the most versatile and feature rich 27" roll laminators available on the market. Dimensions (WxDxH): 38" x 22" x 19"
Carton Dimensions (WxDxH): 45" x 24" x 24"
The Royal Sovereign RSL-2702 is the 27" Desktop Roll Laminator great for both hot and cold lamination and mounting. It features convenient digital controls and independently heated silicone rollers and customizable setup memory channels. The RSL-2702 comes equipped with two independently heated silicone rollers that provide top quality lamination and mounting finish. The front table is removable making it easy to maneuver around the rollers. The protect cover will keep your hands and clothes away from the rollers. Built-in safety switches will keep the rollers running when the front table is removed or the protect cover is lifted. The digital control panel allows you to adjust the hot or cold setting, temperature levels, laminating speeds, and the memory channels. The convenient quick notch system allows you to easily and quickly adjust the gap for the rollers. Change from the laminating setting to the max quarter inch mounting setting in just seconds. The top and bottom removable roll film bars make it very easy and simple to change roll film. The RSL-2702 can accommodate 1", 2.25", and 3" cores. Both top and bottom roll shafts have tension adjusters that will tighten the film roll ensuring wrinkle free flat lamination. The included rear cutter allows users to easily cut off laminating material as it exits to the ear of the machine. The RSL-2702 is a high quality economically priced dual hot and cold laminator that's easy to use and provides professional finishes every time. Backed by 25 years of experience, the RSL-2702 is a smart option for today's print graphics and sign shops. Have you been searching high and low for a versatile roll laminator that can easily fit on top of a table and also process wide-format documents? If so, you'll want to consider the Royal Sovereign RSL-2702, a device that has just about everything you could want in a roll laminator. Let's take a look at this product and see what kind of grade it gets. 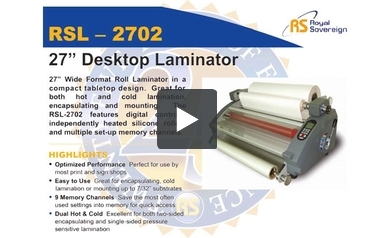 If you've ever wanted a wide-format laminator, the RSL-2702 would be a great choice. It has an enormous 27-inch laminating width that's perfect for graphics, visual aids, posters, and more. The RSL-2702 is also pretty speedy, at least when it comes to actually laminating. It can laminate over 8 feet of material in just 60 seconds, so you can be sure that it won't take you long to process your work. However, the warm-up time is a bit lengthy, clocking in at 10 minutes. This machine is compatible with film that's up to 10 mil thick. You can use rolls with cores that are either 1", 2.25", or 3" across. The maximum roll diameter compatible with the RSL-2702 is 7.9". You can even use mounting boards with this device so you'll be able to create professional-looking signs and other visual aids/displays. The boards can be a thick as 3/16". If you want the best of both worlds - i.e. both hot and cold lamination - then the RSL-2702 is ideal. It can use pressure-sensitive film to laminate documents that could be damaged by heat (including photographs), but it also can get hot enough to process thermal film. It can run at a maximum temperature of 302 degrees Fahrenheit. You can program 9 different temperature settings to make your work much easier. You can expect great results from this machine because it's outfitted with four rollers to make everything go as smoothly as possible. Your documents will look flawless, like they've been processed by a professional. Using this laminator is pretty easy. There's a digital touchpad on the front of the machine that you use to control it and an LCD display lets you know what the device is doing. The RSL-2702 is equipped with an automatic shut-off feature that will help the motor stay in fine form. When the machine is done laminating, the rollers will be cooled off by a built-in system to ensure they'll remain in good shape. This machine was designed to be a tabletop device. It has dimensions of 38" (width) x 21.5" (depth) x 18.5" (height), so finding the right spot for it should be really easy. Finally, the rollers have a 6-month warranty. The rest of the unit is covered for one entire year. Final grade: A. The Royal Sovereign RSL-2702 is a great roll laminator that is perfect for a variety of needs. Not many of these types of devices can successfully combine a great laminating width, hot and cold settings, and a relatively compact footprint. If that's what you've been looking for, the RSL-2702 is definitely the machine you want to get.